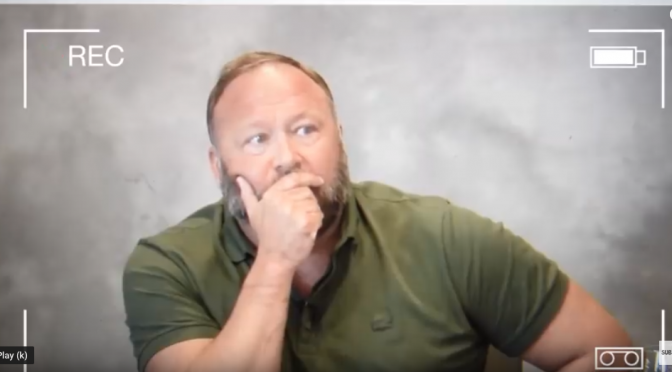 US corporate news media have provided inordinate coverage highlighting specific outtakes of the recent AlexJones deposition in Texas state court. 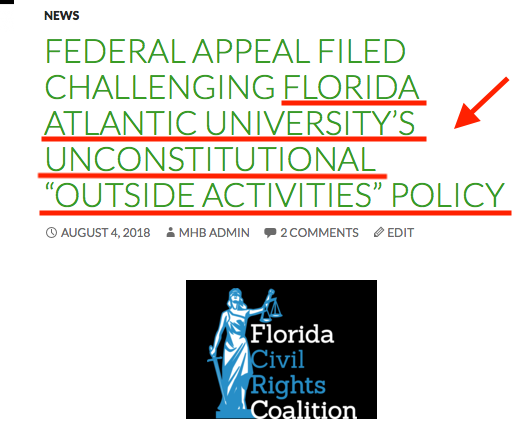 It is perhaps notable how throughout its hullabaloo coverage of the Jones trial same news media have carefully excluded any mention of Professor James Tracy’s pending action against Florida Atlantic University, an arguably more significant free speech case now before the US Eleventh Circuit Court of Appeals. As some may recall, this appeal followed an eleven day trial in December 2017 before Obama-appointed US District Judge Robin Rosenberg, whose numerous pre and in-trial motions grossly favored the FAU defendants by stripping Tracy of his right to assert First Amendment claims and keeping vital evidence from the jury. Despite wall-to-wall, front page trial coverage by the The Palm Beach Post and the South Florida Sun Sentinel, the event was almost completely blacked out by national news media–the same media that widely broadcast the case’s commencement in April 2016 and the circus-like antics of Jones’ deposition. * In fact, the Sun Sentinel has yet to even report to its readership the fact that the case has been appealed. Tracy’s attorneys are still awaiting the court’ decision on the their request to present oral argument before a panel of three appellate judges hearing the case. FAU has argued against the court entertaining oral argument. *In any self-respecting court proceeding, why is the Jones deposition being so selectively broadcast in the first place. It may well be to try the defendant in the court of public opinion, before his case can reach a jury. Editor’s Note: As we have noted (e.g. 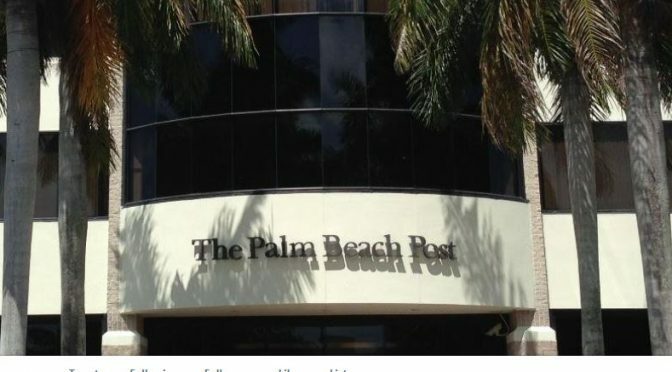 here, here, and here), the Palm Beach Post and South Florida Sun-Sentinel’s TracyvFAU coverage suggests how their editorial boards live in a parallel universe when it comes to accurately reporting on such a significant First Amendment case. One exhibit is the excerpted August 6 article below, the spin of which denigrates Tracy while defending major media’s dubious narrative of the 2012 Sandy Hook massacre event. In this instance we acknowledge that court reporter Jane Musgrave must have in fact read the entire appellate brief (or larger portions thereof) than a previous story suggests since she accurately references the name of its principal author. However, the report fundamentally misses the crux of the case itself. 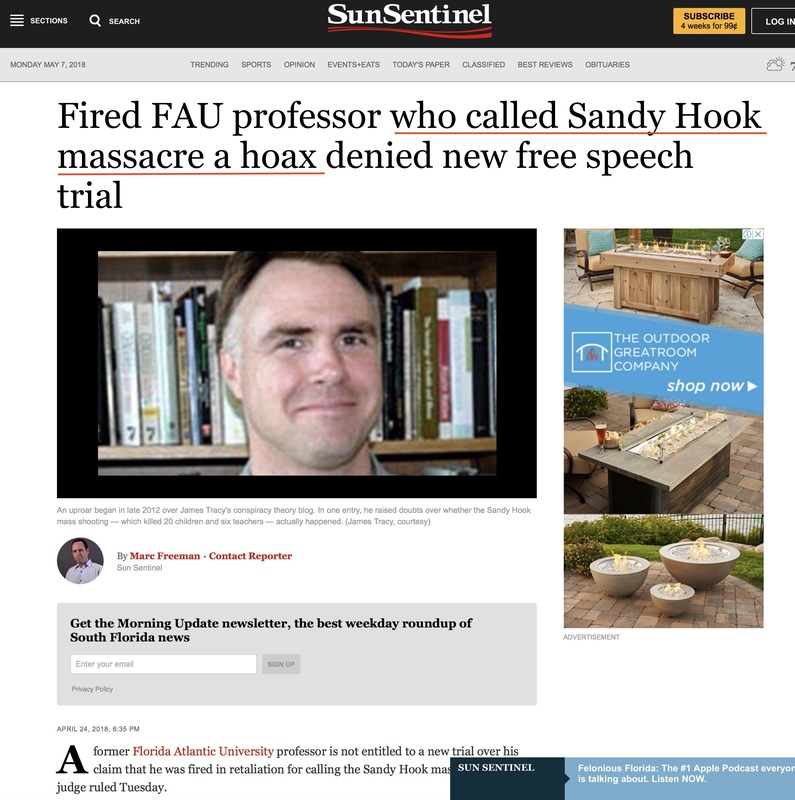 The TracyvFAU appeal does not simply involve “former Florida Atlantic University professor James Tracy[‘s] … right to call Sandy Hook a hoax,” or his “ongoing quest to get his job back,” as Musgrave’s simplistic storyline suggests. 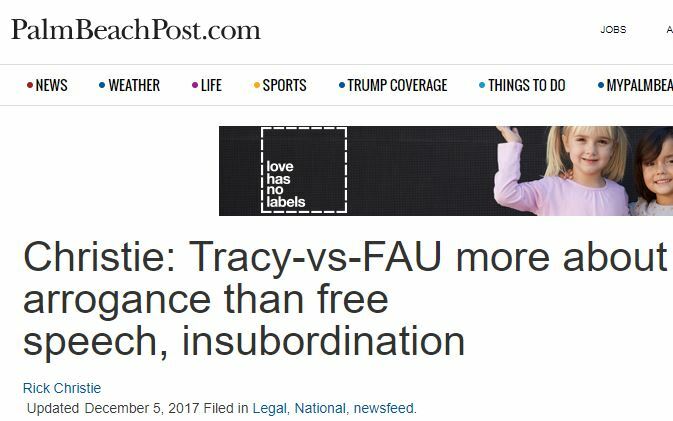 Here’s what the Post’s overall coverage of TracyvFAU (perhaps intentionally) overlooks: FAU is using a policy derived from Florida State Statute as a prior restraint that intimidates with the threat of formal discipline all FAU faculty and staff members from commenting on matters of public concern, or making practically any public remark that could potentially displease FAU administrators and/or trustees, State University System of Florida officials, or the Governor of Florida himself. Academic freedom and free speech at American universities should not resemble that of Communist China’s. Yet it would be difficult to conceive of a policy that is more openly hostile to the fundamental academic freedom and free speech tenets of any self-respecting US university. 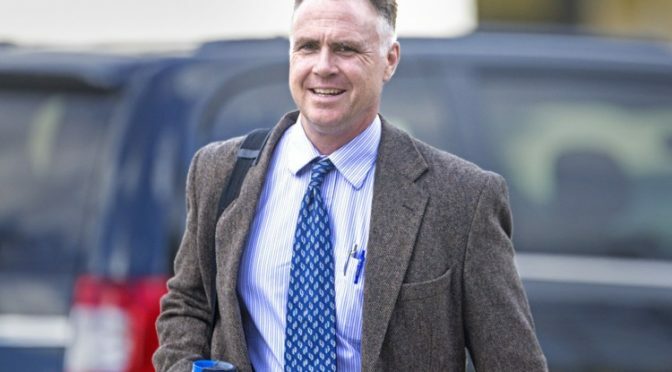 Lashing out at his former bosses and a federal judge, former Florida Atlantic University professor James Tracy is back in court, again claiming he was wrongfully fired for publicly and repeatedly proclaiming that the Sandy Hook massacre was a hoax. 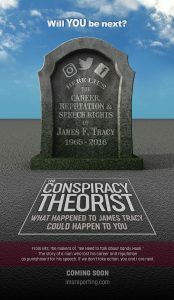 In his ongoing quest to get his job back, Tracy insists a federal jury got it wrong in December when it decided the university fired him for insubordination, rather than for his conspiracy theories about the 2012 Connecticut school shootingthat left 26 children and teachers dead. “FAU fired Tracy in retaliation for controversial posts he made on his personal blog regarding the legitimacy of the Sandy Hook Elementary School massacre,” attorney Richard Ovelmen wrote in a 63-page appeal filed last week with the 11th Circuit Court of Appeal. The university’s claims that it fired Tracy because he failed to report his work on his controversial blog, Memory Hole, are nothing more than a ruse, Ovelmen told the Atlanta-based appeals court. As proof, Ovelmen points out that at least 20 other FAU professors regularly post their views on social media. None has been required to report their activity to school officials, much less been disciplined, he wrote. FAU administrators targeted Tracy after news of his blog ignited a firestorm of protest with scores of letters and phone calls streaming into the Boca Raton-based school, demanding his ouster. What Might Have Coverage Looked Like? 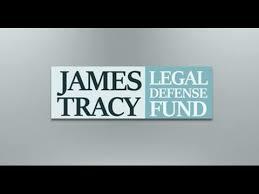 A source close to MemoryHoleBlog has informed us they contacted Palm Beach Post courts reporter Jane Musgrave via telephone following the December 2017 trial of TracyvFAU wherein FAU Professor James Tracy sued his former employer for civil rights violations. This individual asked the reporter why the Post‘s coverage was so egregiously biased against Tracy and favorable toward FAU. When the party pressed Musgrave on why the newspaper’s coverage included so many glaring omissions of important evidence and testimony–content that would have put Tracy in a more positive light–the reporter responded, “We weren’t allowed to report that,” and that at the end of the day the Post would never publish anything supportive of the plaintiff. This conversation confirms what the TracyvFAU plaintiff and his legal team observed as both the Post and South Florida Sun-Sentinel‘s sensational and flagrantly misleading coverage throughout the trial and even after the jury verdict was rendered. The story titles alone suggest the Post‘s clear bias, with the Post referring to Tracy as the “Sandy Hook denier.” In one “opinion piece” the newspaper even solicits an embellished defamatory account of Tracy’s teaching style from one of its salaried employees. 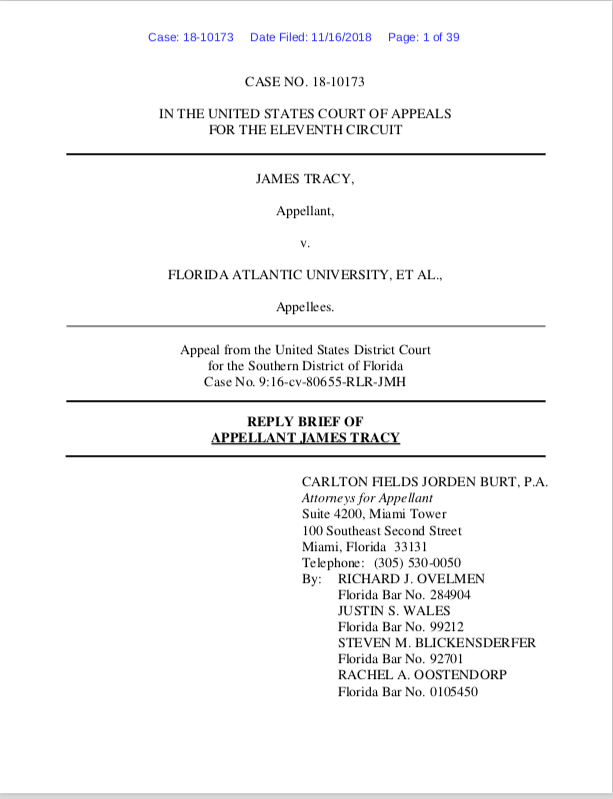 After lengthy litigation and a trial where a federal judge repeatedly defended FAU and its administrators from the bench, the Post continued to ignore crucial testimony given by Tracy’s colleagues that demonstrated just how haphazardly the university’s provosts and deans applied the “Outside Employment/Activities Policy,” and how Tracy was virtually the only employee required to submit an “Outside Employment Form” for his protected speech on a personal blog. Both the Post and Sun-Sentinel are so desperate to please this large advertiser that they are willing to effectively skew their coverage of one of the most significant First Amendment trials in recent history to fit what they perceive to be their readers’ prejudices–in fact, misconceptions that these papers and national news media played a major role in creating via slipshod if not fraudulent coverage of the December 2012 Newtown shooting. In this vein Musgrave is forced to function as an anti-journalist–one who documents an event then proceeds to deliberately deceive her readership. Musgrave’s reportage, probably at her editor’s behest, repeatedly emphasizes Rosenberg’s ruling to deny the plaintiff a new trial. Further, it is obvious that Musgrave never read Tracy’s Motions (here and here) since her slapdash piece attributes their authorship to Louis Leo IV, when in fact they were primarily authored and signed by co-counsel. The Sun-Sentinel‘s brief story of Rosenberg’s ruling is (unsurprisingly) more reckless, as education reporter Marc Freeman fails to even mention the fact that the case is on its way to the 11th Circuit Court of Appeals. At the end of the day the eight-hundred pound gorilla in TracyvFAU must necessarily be overlooked by the Palm Beach Post, who ultimately answer to its owners-in-abesntia, the politically liberal Cox family. James Tracy stands accused of calling out Democratic President Barack Obama’s administration of staging a mass shooting at Sandy Hook Elementary in order to institute more stringent gun control laws. 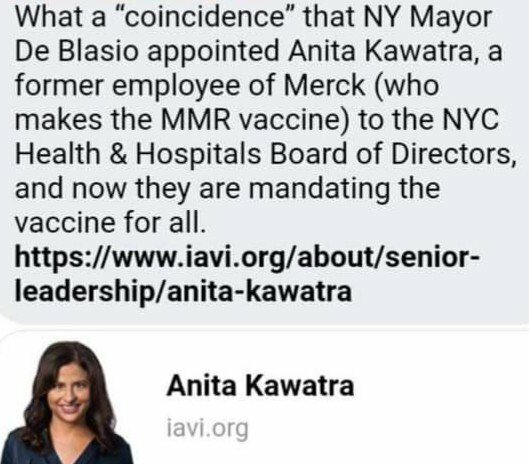 In December 2015 Tracy was (falsely) accused of criminally harassing the ostensibly Jewish “Sandy Hook parents” while consorting with “holocaust deniers.” These inflammatory accusations ultimately led to his termination. According to the Post itself, Judge Rosenberg’s ultra-wealthy “Palm Beach parents are both well-known Democratic donors.” Rosenberg was appointed to her federal judgeship by President Obama in 2014. Rosenberg’s spouse, former Palm Beach County state attorney Michael McAuliffe, is a career Democratic Party politician. It is no secret in South Florida that he has major congressional and quite possibly gubernatorial aspirations. Such ambition requires maintaining the good graces of Democratic Party power brokers whose central political platform is celebrating Obama’s political “achievements” and stampeding the US public into enacting stricter gun control. If this isn’t enough McAuliffe’s law partner, Martin Reeder, is the Palm Beach Post‘s attorney. One can only ponder how thick the “firewall” is between the newspaper’s editorial room and the McAuliffe-Reeder firm. Rosenberg is also a former board member of the radical Anti-Defamation League, the Zionist espionage and agit-prop organization that stands vehemently against extending free speech to all and believes that any Gentile who so much as sneezes the wrong way is “hateful” or “anti-semitic.” The ADL is typically so extreme that its mention often elicits embarrassed eye-rolls from many in the Jewish diaspora. Despite these conflicts of interest Rosenberg apparently never considered recusing herself. She instead allowed the plaintiff to embark on a costly litigation process then slammed the door in his face with a comprehensive October 31, 2017 summary judgement order in favor of FAU. 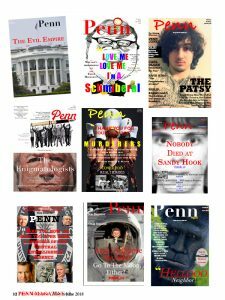 With the trial the court simply gave defendant FAU, with the assistance of its advertising clientele, full exoneration in the court of public opinion. Imagine for a moment if Tracy was a progressive-left professor terminated from his tenured faculty position for blogging about “climate change,” the villainous President Trump, and the conspiracy theory that Trump allied with Russia to subvert the 2016 election process. One need only look at the many Facebook pages, Twitter accounts, and blogs of American academics that fit this very mold–some of whom work at Florida Atlantic and the state’s other publicly-funded universities. Imagine that the judge comes from a “well-known” Republican Party donor family and was appointed to the bench by Donald Trump. Imagine the judge is married to a prominent Republican Party politician. Imagine the judge was Episcopalian and an active member of the National Rifle Association. Then imagine just how different the Post‘s coverage of TracyvFAU would be? The two articles linked below discuss former FAU Professor James Tracy’s lecture in FAU Political Science Professor Marshall DeRosa’s April 5, 2018 Issues in American Politics class. 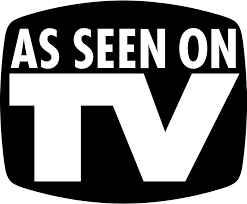 Tracy presented a roughly 75-minute presentation on “The CIA and the Media.” The discussion was based on information from 1970s Congressional hearings and subsequent historical treatments of the phenomenon, which Tracy argued continues to this day. The presentation was followed by about 50 minutes of addressing questions from students. What Would Fair and Balanced Journalism Have Looked Like? 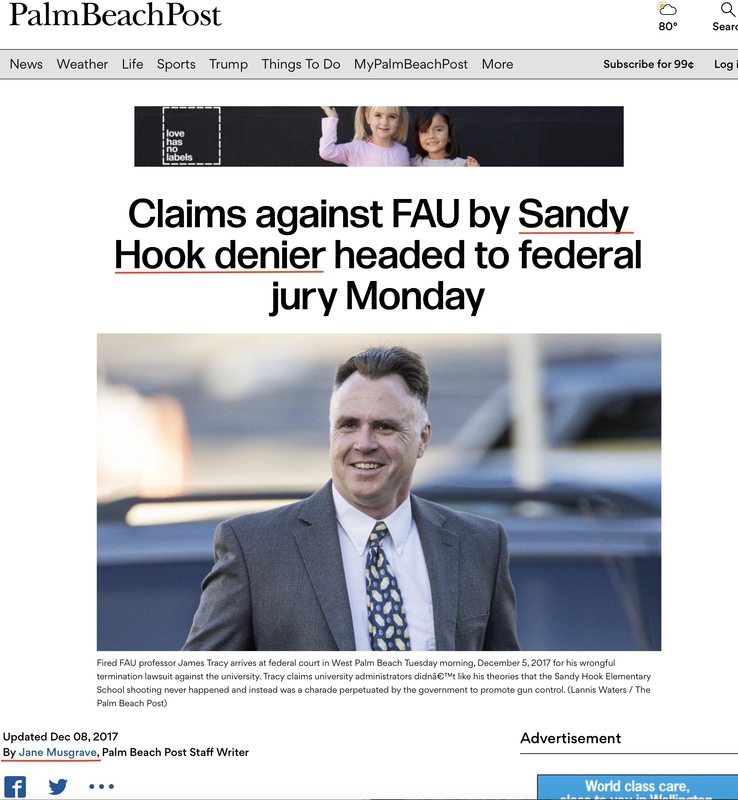 The Palm Beach Post and South Florida Sun-Sentinel’s overall coverage of the December 2017 TracyvFAU trial looks as if it could have been written by the Defendant University’s “Department of Media Relations.” Post and Sun-Sentinel managements recognize how FAU’s multitude of advertising dollars is a key support in their erroneous and uncritical reportage of complex public events and broader operations. With the trial each outlet skewed its reportage and editorial commentary to heavily favor the school, thereby securing for their client a positive verdict in South Florida’s court of public opinion. 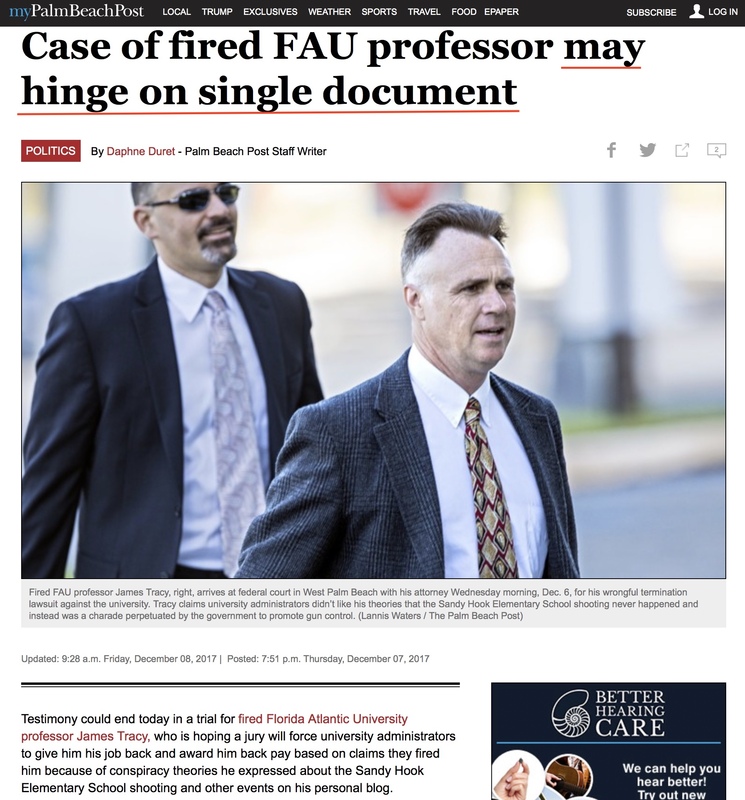 In fact, the papers pulled their reporters from the courtroom entirely when crucial testimony was given by Professor Tracy’s colleagues and fellow union officers giving the lie to the central argument of FAU’s million-dollar defense—that Tracy consciously violated a school policy rigorously adhered to by all other faculty and employees. On December 11, 2017, in a serious miscarriage of justice, a jury in West Palm Beach, Florida, ruled unanimously in favor of Florida Atlantic University and against former Media Studies Professor James Tracy, who was suing for reinstatement after his firing in 2016. The jury found that Tracy’s “controversial” articles on Memory Hole Blog were not a “motivating factor” in his firing, the only question they were required to consider. 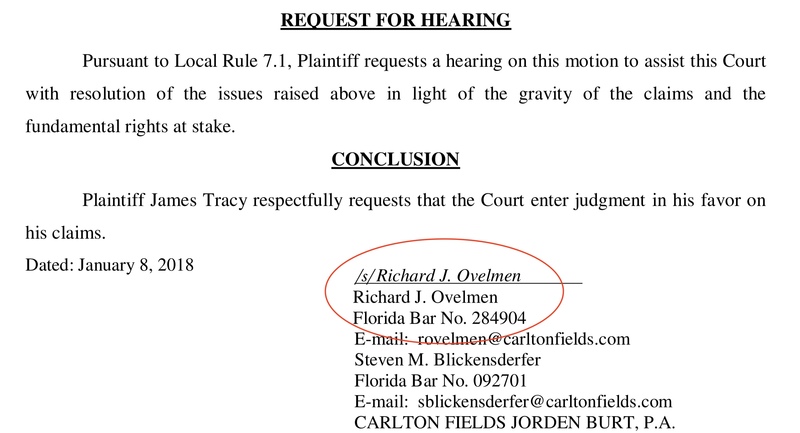 Of course, Tracy’s posts at “his conspiracy theory blog” were indeed the reason he was fired, but the jury was convinced otherwise by FAU’s legal team with assistance from the judge. The case centered around Tracy’s writings on the anomalies found in the reporting on the Sandy Hook “massacre” of December 14, 2012. His skepticism about the event was not to the liking of the university. James Tracy with his attorney Louis Leo IV arriving at federal court. Image: Palm Beach Post. FAU maintained that Tracy was not fired from his tenured position because of his blog posts, but because he did not follow the “rules” set out by “his bosses” at the government-run institution. FAU attorney G. Joseph Curley insisted that Tracy was not denied his First Amendment rights, but that he simply did not follow university procedure. “Professor Tracy doesn’t follow the rules,” Curley told the jury. “They’re rules that everyone else follows. 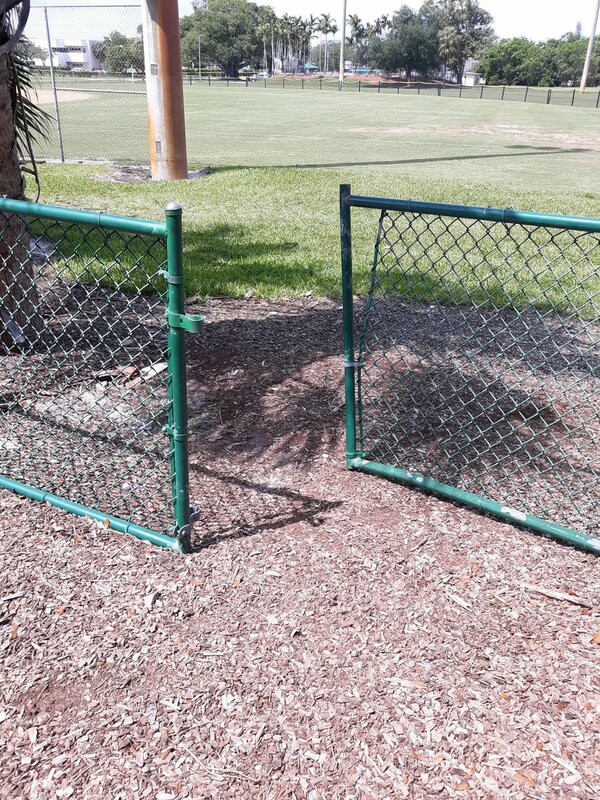 He doesn’t play by the rules.” FAU cast the case as one of a “belligerent,” rebellious,” and “nonconformist” employee being let go for “insubordination,” instead of that of a tenured professor exercising his right to free speech. 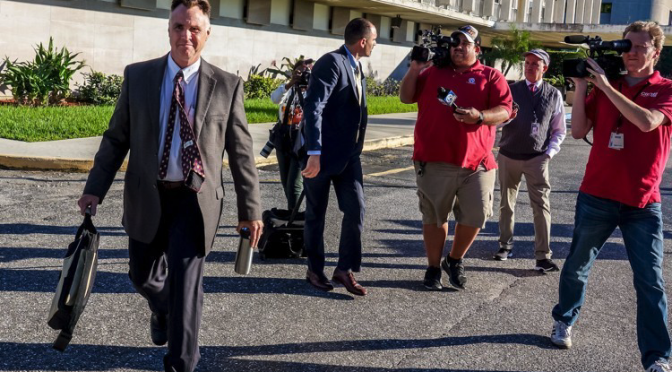 FAU attorney G. Joseph Curley: “I could not be happier for FAU.” Image: Palm Beach Post. FAU’s current “rules” require that faculty submit forms listing “outside activities” to be vetted for administrative approval, whether the activities are compensated or not. Tracy and other professors at FAU had argued that the policy is vague and confusing, constituting a form of prior restraint forbidden by the First Amendment, and leading to a climate of “fear and uncertainty” among the faculty. Aside from the fact that “outside activities” can reach into all aspects of a professor’s life and therefore be difficult if not impossible to list, such activities must not be subject to bureaucratic approval. 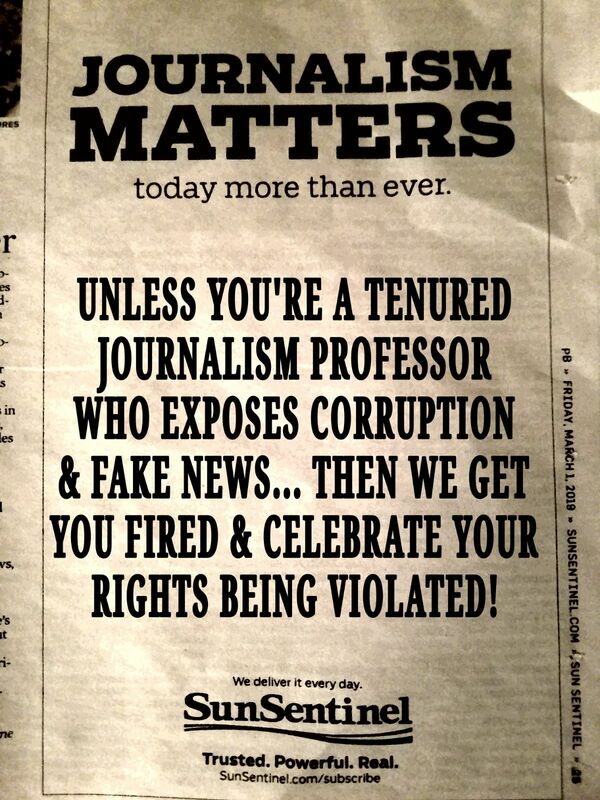 And certainly, no tenured professor can be fired for not filling out a form, even at Florida Atlantic University.